This is a lovely and healthy winter salad. The flavor of the mango blends well with the rutabaga and both are ripe at the same time. We really enjoyed this salad. Slice the spring onion (the white and light green parts) in thin slices. Mix the lemon juice, oil, agave, spring onion pieces, salt and pepper into a smooth dressing/marinade. Peel the rutabaga and slice into matchstick sized pieces. Bring a pot of lightly salted water to boil and cook the rutabaga pieces for a few minutes until al dente. When they have become al dente (test with a fork), drain the water off and plunge the rutabaga pieces into icy cold water to stop the cooking process. Drain the cooled rutabaga and place in a bowl. Pour the dressing/marinade over and mix well. Allow to season for at least 20 minutes. Toast the nuts or seeds lightly in a dry pan. Grate or slice the soy cheese. Wash and pat dry the basil leaves. Slice the broad side of the mango in half near the seed. Do the same on the other side and slice around the seed as well. 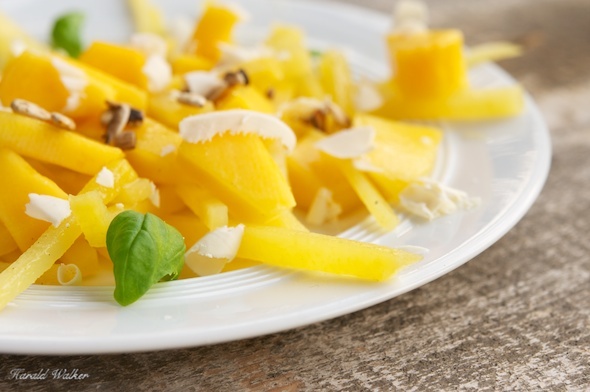 Peel the mango pieces and cut in pieces as desired for the salad. 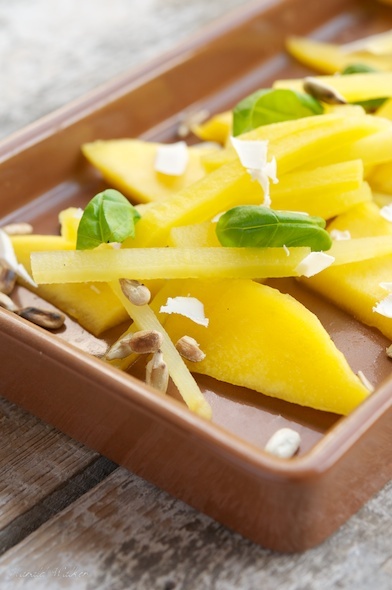 Serve the salad with the rutabaga slices and mango pieces on individual plates. Reserve the dressing/marinade to use as a dressing. Place basil leaves around the plates and sprinkle the toasted nuts or seeds on top. At last, sprinkle the grated or sliced soy cheese around the plates and serve. Posted by Chris Walker on January 24, 2013 in Mango, rutabaga, Salads, Soy cheese.